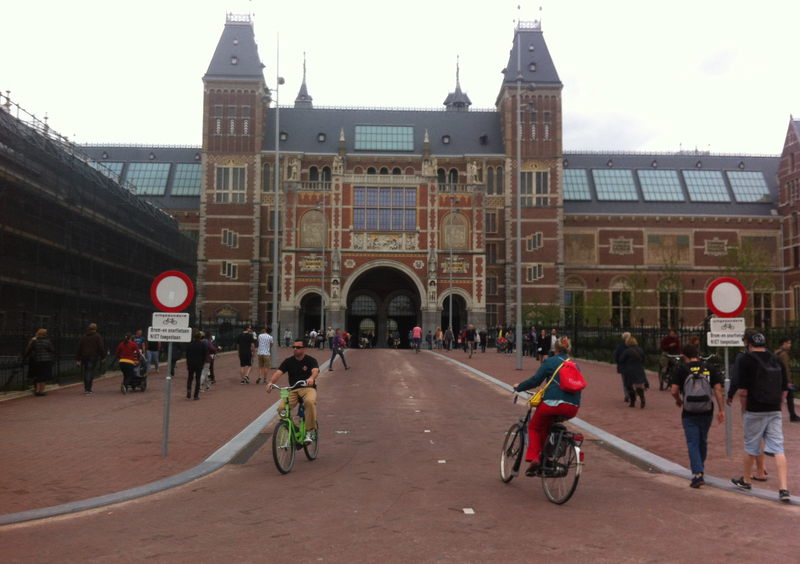 IMAGES: What can Irish cities learn from cycling in Amsterdam? Dublin and Amsterdam are cities of a similar enough scale in many ways, both have many narrow city centre streets, their population sizes and density are not a million miles different, and both have similar climates so suffer very similar weather. 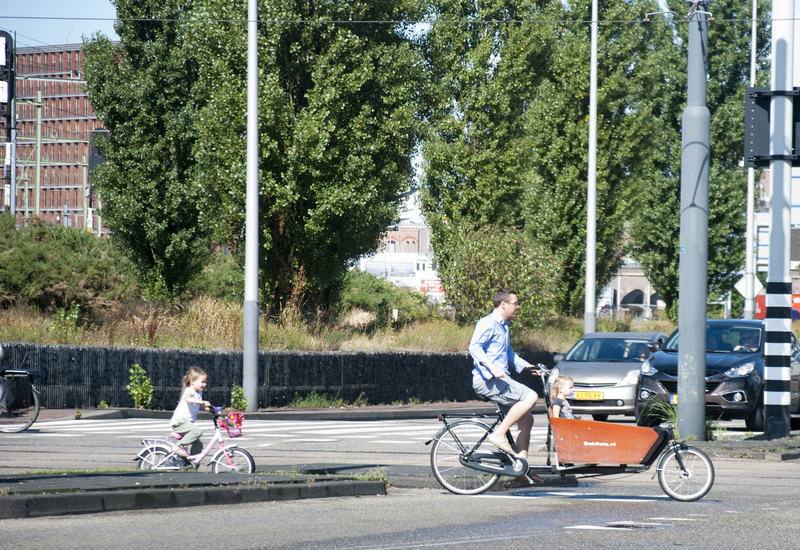 But Amsterdam residents cycle a lot more and one of the key differences is how that city’s streets and roads are designed for cycling; so, what can Dublin learn from its Dutch counterpart? And can other Irish cities pick up tips along the way? Not only is it common for parents to be transporting young children, but the highly segregated cycle paths are suited for young children to cycle their own bikes, even across junctions of larger roads. 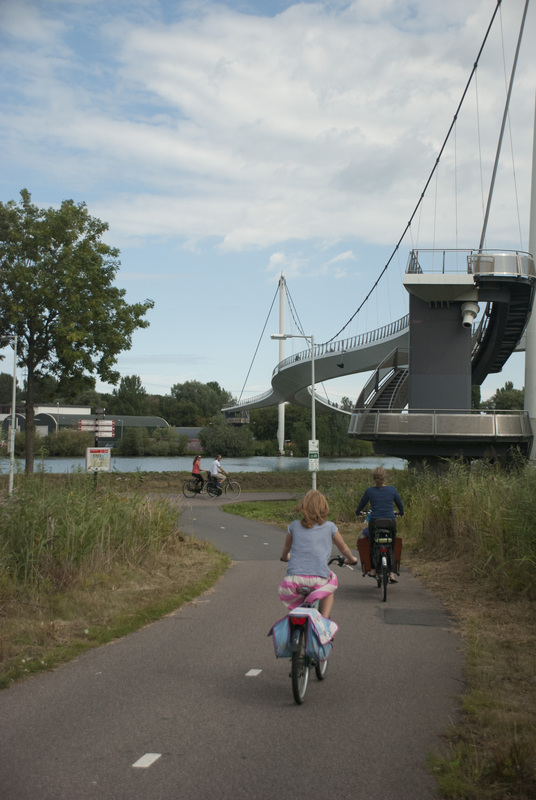 The social of cycling aspect of cycling is a highly important feature of Dutch cycling culture. 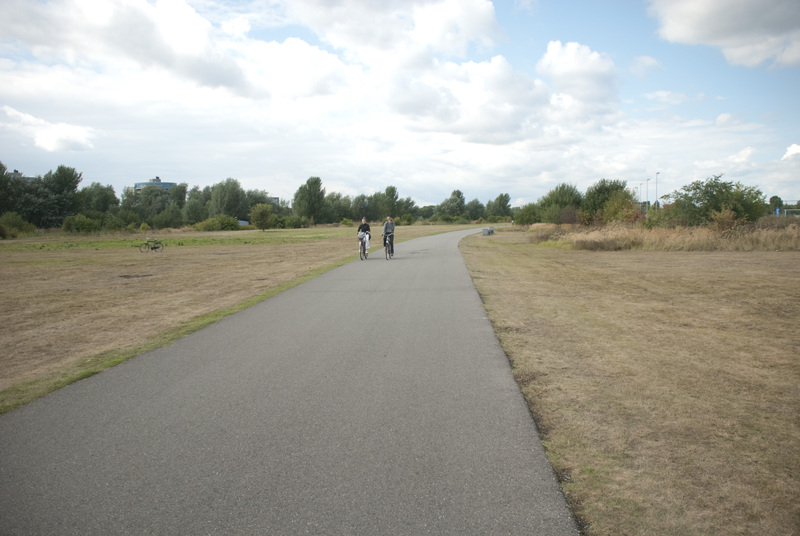 Not only do people cycle with their friends, the cycle path network allows them to cycle alongside their friends. The NTA already seems to see the importance of this, with the draft Dublin cycle network mentioning “space for side-by-side ‘social cycling’“. If you want to overtake, for example on the below cycle path you can nearly scoot by — but on this or narrower paths, a ring of your bell works wonders when the cyclists ahead have not noticed that you want to get ahead. At times we were both the faster cyclists and those pqottering about — the system works remarkably well. Contra-flow example 1: Signs only at entry points; at the contra-flow end of a street the signs would usually be no-entry signs along with smaller plates below the signs which say the Dutch equivalent of ‘expect cyclists’. The streets are typically low speed and very narrow. There’s just about or even not enough space for a cyclist to be passed by a motorist, both are forced to navigate around each other slowly. 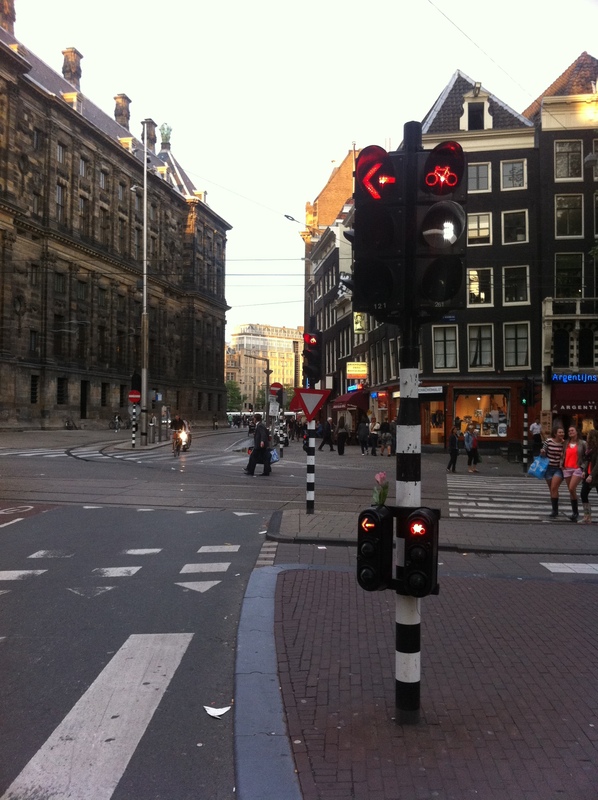 The use of this type of contra-flow is common place in Amsterdam, however we know of just three locations where it is used in Dublin. For the cost of bylaws, signs and a communications campaign, this contra-flow could be rapidly expanded across a number of areas around Dublin think Phibsborough, Portobello, South Lotts, Smithfield, parts of Rathmines, Rathgar etc). 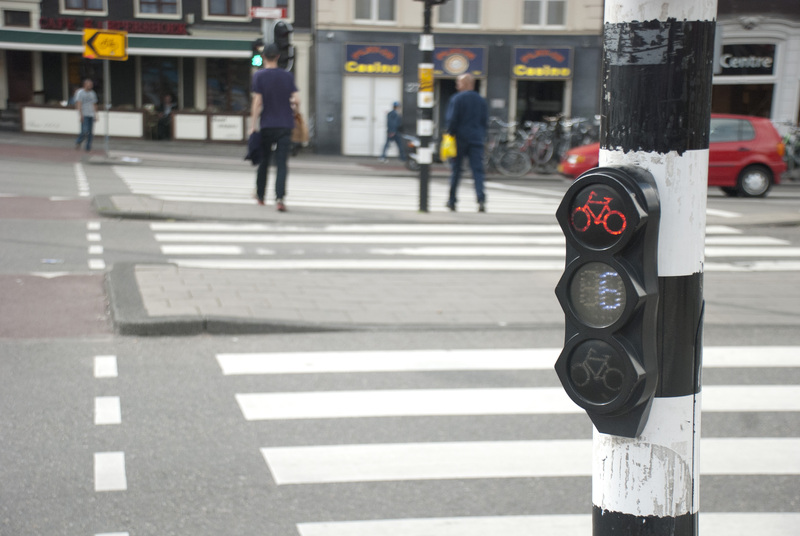 This is not a design that only works in the Netherlands or in Denmark; as well as the limited examples in Dublin, it’s a tried and tested design which is used in Paris, Berlin, and Belgium. Below is the other side of the street behind the above photograph: Note how the traffic lights show highlight that general traffic can only turn left here, but cyclists can go ahead. Just out of the image is the contra-flow lane in the opposite direction leading to the street behind this picture (Street View). Contra-flow example 4: Below is a cycle lane inside a tram / bus lane, all contra-flow to general traffic which can only go one-way on this street. Dublin could learn from this with Luas Cross City — this design could for example be used on Parnell Street. 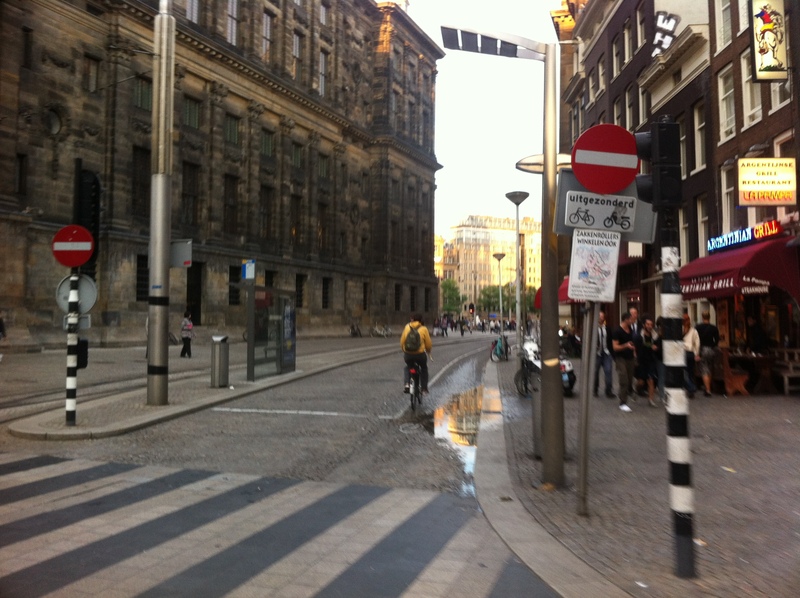 Amsterdam takes filtered permeability seriously. An example we’re not suggesting to copy is a cycle path inside a museum (unless anybody reading is designing a new build). 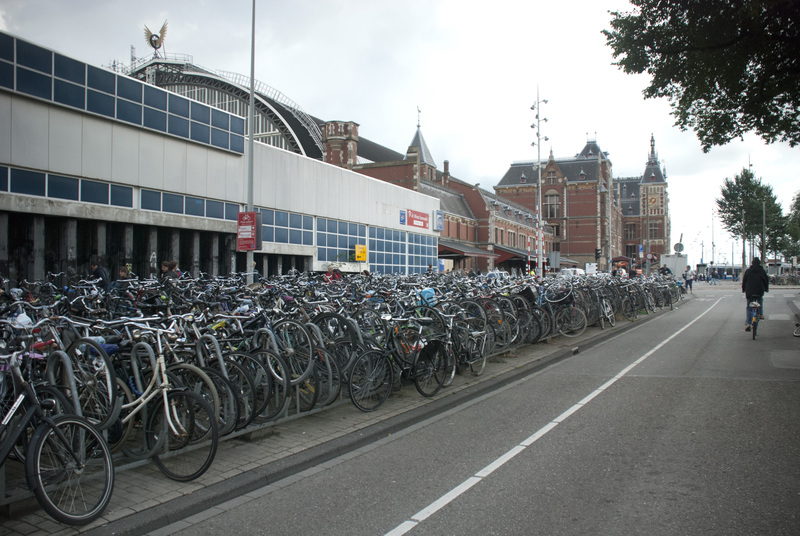 Dutch cities have to use large-scale bicycle parking to accommodate bicycles in central areas and a busy train stations. Maybe on a far smaller scale than below, Dublin City Council is already looking at solutions (in addition to Drury Street Car Park). 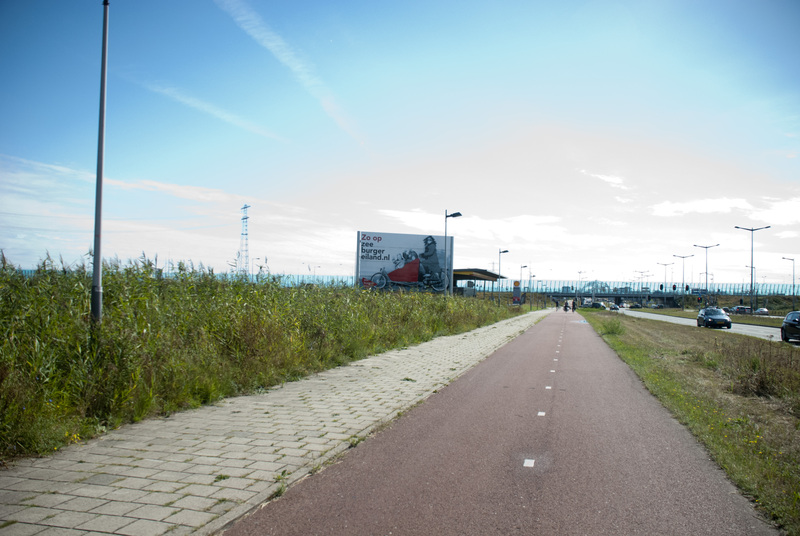 And, finally, something not to follow Amsterdam on: Don’t allow scooters on cycle paths. I wonder how many arguments our (wonderful) goverment will throw up regarding cost??????. I was there myself a few weeks ago and would come to similar conclusions from what I saw. Unfortunately I didn’t cycle on this trip, due to the nature of the group that I was with. From previous cycling there from about 10 years ago, it was a good experience compared to what Dublin was like then. We have much caught up since then and are continuing to do so. Segregation encourages a much wide group of people to choose cycling as transport. Unlike Dublin at the minute, where the male under 50 usually clad in Lycra with helmet makes up a sizeable number. For most, cycling is seen as a sport or a daredevil activity for the crazy ones. Cycling as transport is hard to beat for its sheer convenience particularly over the shorter distances. It manages to make the city seem small by how quick the journeys are, even at a slow pace. Hold on a minute…if ‘Cycling in Dublin’ won’t advocate for a cycle route through IMMA (“An example we’re not suggesting to copy is a cycle path inside a museum”) then who WILL…? Why not have a situation similar to Trinity front entrance, where the cyclist dismounts at East and West entry to IMMA building, can cycle in the courtyard, and even park bikes there (shock!) …at present its such a ‘suburban’, empty place most of the time, with a tiny cycle park off out in the field with the cars…how very 21st century Irish ! 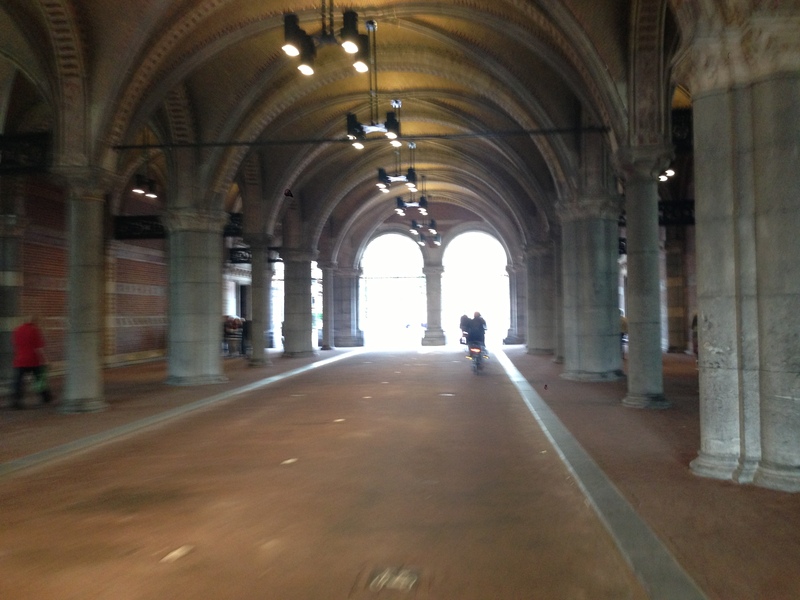 @ Alan — Even if you did not need to dismount (which is needed with the narrow entrance), I’m not sure if cycling into and out of the IMMA courtyard would offer the same benefit as the Rijksmuseum. But I would agree parking there could be much better parking at IMMA and the route around the building could be better (at the very least a cycling bypass to the speed ramps). BTW the draft GDA cycle network has a feeder route going south/east-north through Trinity. hello, this is not related to the above article. What i would like to know is, if you buy a car its all there, lights horn mudguards.But if you buy a bike you have to buy all these as well,WHY.